It’s been a long time since I posted a vault tip, and over the past few months visiting and working with my clients, I have noticed a trend. 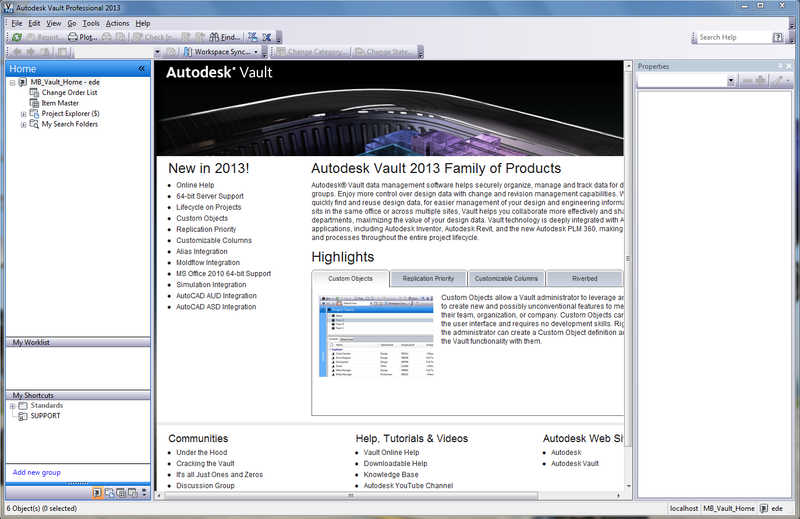 Most, if not all, have frozen the vault interface in one configuration and have forgotten that the Vault client interface is, for the lack of a better term, Dynamic from a look and feel point of view. Figure (2) – Many users, after selecting their “Designs” folder, see this presentation, and they have forgotten the optional areas I have pointed out that will change the look and feel of the interface. Not only providing for a cleaner look, but providing a more productive and easier to use interface. 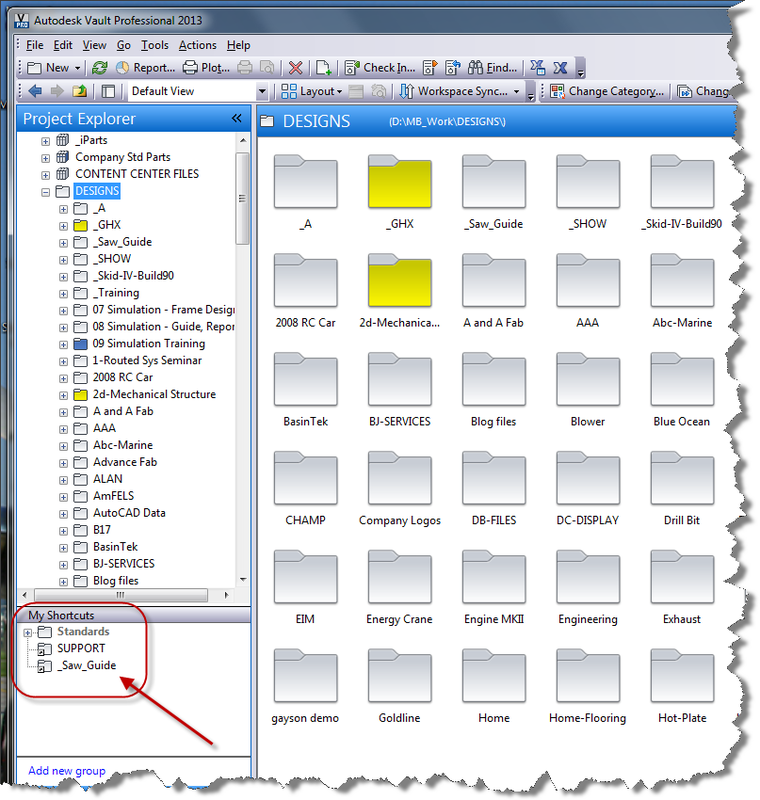 I see many users using the Navigation panel to dig though the vault to find a file buried in a folder. Figure (3) – Now this represents a Vault Interface where I can easily find the folder I’m looking for without scrolling through the Navigation pane for several minutes. Here, I can go right to the folder I need. You will notice the RED arrows pointing to the Property pane in the collapsed state on the right, and the Project Explorer pane collapsed on the left side. 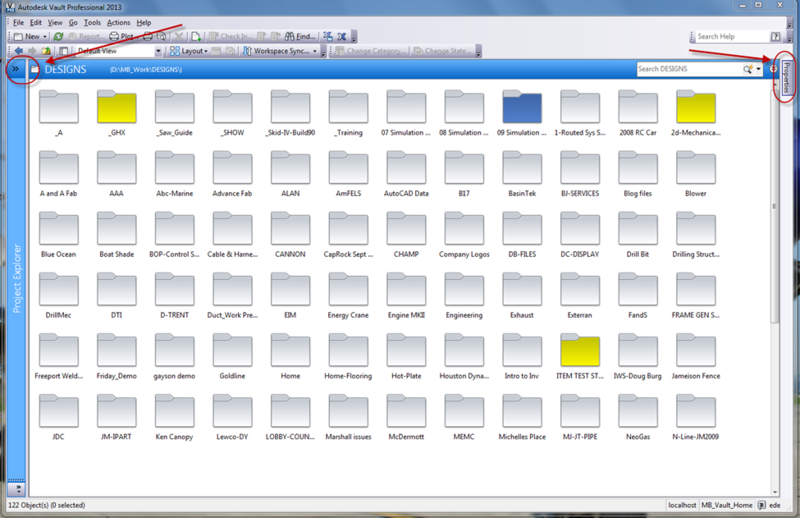 This allows for more screen real-estate for the folder view. Figure (4) – In this particular screen snapshot, I’m highlighting the shortcut area. 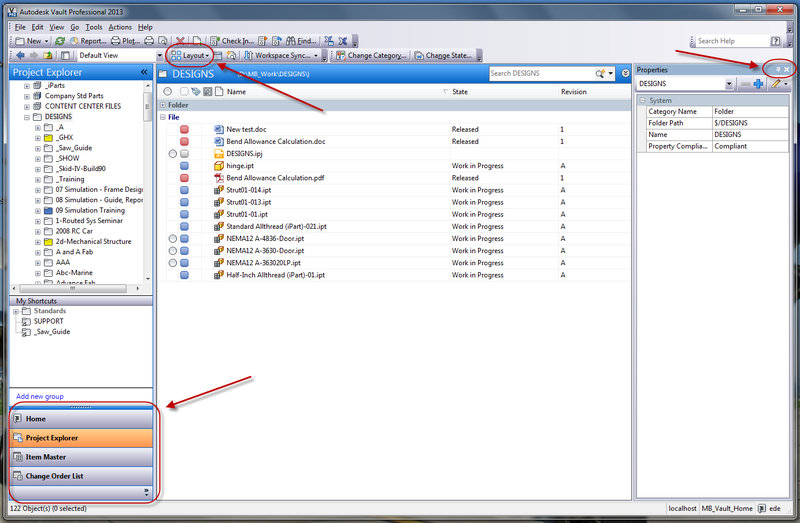 If you have ever placed a folder, file or a folder containing a link to other project related information, you have probably noticed that when opening, a file from the Vault from within Inventor these shortcuts appear, again making it easier to get though the day in the office. I use this all the time during my Inventor working sessions. Figure (5) – And finally last but not least, I saw a Discussion on the Support Blogs the other day referring to Vault Professional not able to show the versions of a file. Well unless I completely misunderstood the complaint, the answer is yes, you can. If you review the RED arrows below, you will see I’m in the History tab of the View pane (Arrow #1), and I have Show all Versions switch on (Arrow #2). Now this is not how it is set out of the box. You will need to add the Version field (Arrow #3) to the window by customizing the view. Once added, you will see all the versions and their associated number…easy to do. Check out Customizing the view in the Vault help or Secret TIP: right click anywhere on your vault preview pane, approximately in the view area where my numbers are, and select “Customize View”. I am getting more and more calls on this issue. I’m not sure if this is exclusive to Civil 3D yet. The only calls I have received so far is that this issue is in Civil 3D. When switching from Paper Space to Model Space, the UCS will rotate by itself. This also happens when you save, get out of the drawing and then open it back up. This seems to only happen when there is a saved view in the drawing. Others might experience it without having a saved view. I had this happen to me the other day. I unknowingly had a saved view in the drawing, which I never used, and this issue happened. 1. Delete the saved view(s), save drawing, close, re-open. 2. Go to the View tab, switch to Top view, save, close, re-open.